Customized information literacy instruction: Customized class sessions can be arranged to meet students’ needs and to supplement course assignments. Library staff are available for consultation prior to sessions to discuss research topics. Tours and orientations: The library also offers general tours and new student and faculty orientations. Tours and orientations can be arranged to highlight collections and services. Information desk services: The library offers on-demand instruction at the information desk: live, via chat, phone or WebEx. When answering reference questions the library staff demonstrate their research techniques and treat these interactions as teachable moments, rather than supplying the patron with the answer. Supplement and reinforce skills taught in the information literacy workshops, customized information literacy instruction sessions, tours, and orientations. Guide students to relevant sources and provide information literacy instruction at the point of need. Provide supplemental instructional materials for faculty to embed into their courses to support information literacy initiatives. Students who attend Wayne College may choose to complete their coursework on-site at the campus in Orrville, at their local high school (as part of the College Credit Plus Option), at any of the college’s satellite locations (The Holmes Campus, The Medina County University Center), or online. In order to extend the reach of library services beyond the brick-and-mortar building on campus, the Library staff maintain a strong online presence for off-campus students. Traditional informational and reference assistance is supplemented by online chat and text service options and web conferencing tools like WebEx. Library information literacy workshops are available online through the Library’s Brightspace classroom. 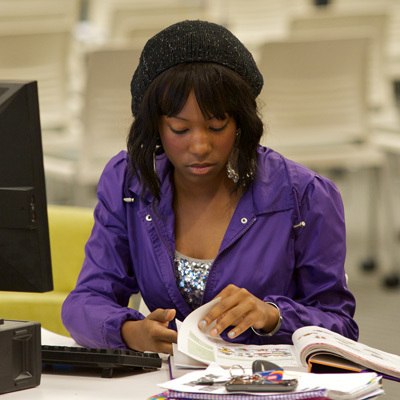 Research guides are provided to off-site students at the point of need. Finally, the librarians are available to present customized information literacy sessions at any of the off-site locations or via web conference.